Yesterday was a busy travel day for us. About 1 pm we got loaded in Scottie Personnel Carrier (SPC-NONARMORED) along with my Daddy (i.e. Catman), Mama, and Hooman Grandpa and headed to the Chicago Airport. Traffic there was terrific (and not in a good way). 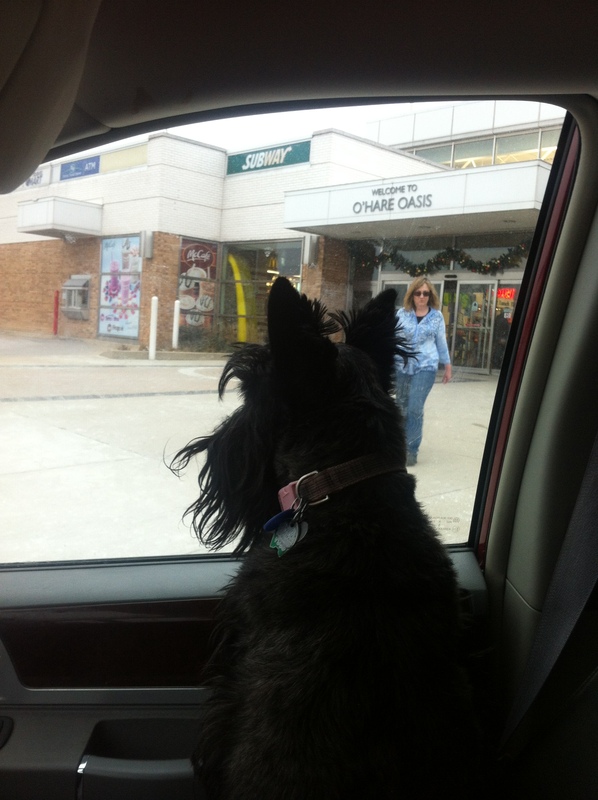 We had a few minutes til hooman sis flight arrived at O’hare, so I had a brief pitstop at the tollway Oasis. I went to sleep while we went back in the SPC-NONARMORED to the airport, but woke up to a start with hundreds of people around the van, and I gave those people at the Arrivals section of Terminal 3 their Barking of a Lifetime. 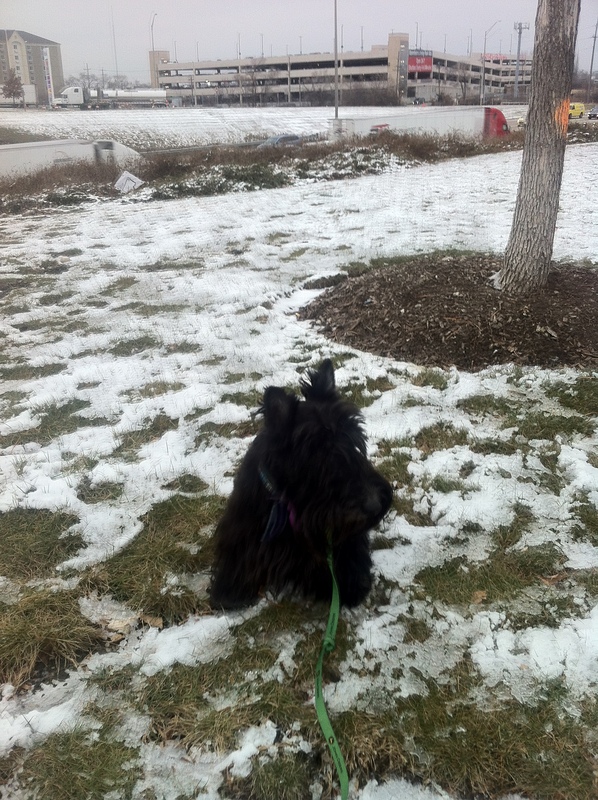 We met Hooman Sis, and gave her a standard issue haven’t seen you in 6 months Scottie Greeting (Happy, tail wagging, but not crazy overboard in demonstrative affection – not as crazy drooling on you, jumping on you happy like a Golden Retriever greeting, but happier than a cat greeting). Then on the way home we stopped at the Oasis again to get Hooman Sis some liquid hydration (why she didn’t travel with her standard issue canteen I don’t know). We saw that WGN-TV was there with their mobile van, and there was a reporter with a cameraman there. I asked if they wanted me to comment on the tragic events of Facebook deleting Pet Accounts, but they said they weren’t interested, they were there to talk about the traffic. Typical biased mainstream media. So Mama came back to the SPC-ARMORED(Seen here with Ainsley watching for threats to her, and we headed back west toward the Manor. But we didn’t go home just yet. We stopped at Harry Carey’s, and while me and Ainsley stayed in the SPC-ARMORED, the hoomans got dinner. But HOLY COW, they brought us some Filet Mignon. Tell ya what, that bespectacled sportscaster sure knew how to fix a mean cow. Finally, we got home, about 8 pm. And this pic shows it was all worth the trouble. 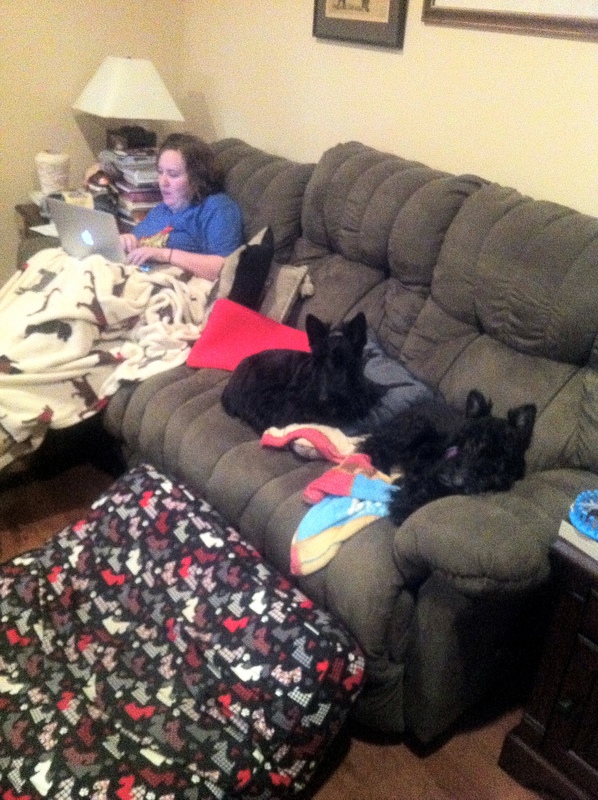 It’s Hooman Sis, Ainsley and Me, from Left to Right. Next Post My Daily Thanksgiving Turkey! What an adventure! Sounds like a great reunion! Happy Thanksgiving to you all. Thank you Penny! I did have the opportunity to invite 2 more to our party coming up next year – Ficelle and her hoomans, and Wrigley & Xena Schnauzer from Texas. I don’t think Wrigley & Xena are going to make it – they say they don’t like road trips and get car sick. Ficelle says she is strongly thinking about it. So glad you made it though hazards territory and are home safe and sound. Happy Thanksgiving to you and Ainsley and all your Peeples, Sweet Angus!! Mac and I send hugs from Houston! ❤️!!! Happy Thanksgiving, Sir! May I suggest an interview on the Fala New Channel to cover breaking news regarding FacebookGate? The Mainstream media is so last Century, anyway. Who needs them? Harry may know how to cook cow, but there was always a libation when he did anything. Happy Thanksgiving! And filet mingon, yummm. Happy Thanksgiving Angus, Ainsley, Mama, Catman, hooman sis and Grandpa. A good soldier never stops and good to see you still on the job. You look awfully comfty on that sofa too. Happy Thanksgiving, AF and Ainsley! Happy Thanksgiving to you and your troops! I sure hope your hooman sister has you & Ainsley come to Edmond soon! It’s time for another GGathering of the Scotties don’t you think?